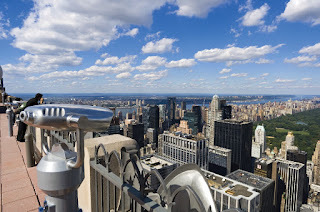 Rockefeller Center Picture Maps Interactive 360 Street View. Rockefeller Center is located at West 49th Street-51st Street, and 5th Avenue to 6th Avenue - Avenue of the Americas. Built by the Rockefeller family, it is located in the center of Midtown Manhattan, spanning the area between Fifth Avenue and Sixth Avenue. It was declared a National Historic Landmark in 1987. Open 365 days a year, it is, quite simply, the most spectacular view in New York City. The view itself is unique and astonishing. Unobstructed 360 degree views from the 70th floor, of the breathtaking landscape stretches for miles in every direction from Central Park and the northern half of Manhattan to New York City's other landmarks including the ,Times Square, Chrysler Building, the Hudson River, the East River, the Brooklyn Bridge, and the Statue of Liberty! Radio City Music Hall at 50th Street and Avenue of the Americas was completed in December, 1932. At the time it was promoted as the largest and most opulent theater in the world. Rockefeller Center original intended name was the "International Music Hall" but this was changed to reflect the name of its neighbor, "Radio City," as the new NBC Studios in the RCA Building were known. RCA was one of the complex's first and most important tenants and the entire Rockefeller Center itself was sometimes referred to as "Radio City." The Music Hall was planned by a consortium of three architectural firms, who employed Edward Durell Stone to design the exterior. Through the direction of Abby Rockefeller, the interior design was given to Donald Deskey, an exponent of the European Modernist style and innovator of a new American design aesthetic. Deskey believed the space would be best served by sculptures and wall paintings and commissioned various artists for the large elaborate works in the theater. The Music Hall seats 6,000 people and after an initial slow start became the single biggest tourist destination in the city. Rockefeller Center interior was declared a New York City landmark in 1978. Painstakingly restored in 1999, the Music Hall interiors are one of the world's greatest examples of Art Deco design. After decades as a premiere showcase for motion pictures and elaborate stage shows, the theater converted to presenting touring performers and special events in 1979. Each holiday season features the annual musical stage show, the Radio City Christmas Spectacular, a tradition for more than 70 years. The enormous stage, with its elevators and turntables, has also offered Frank Sinatra, Ella Fitzgerald, the Grammy and Tony Awards, and countless other events. One of New York's most popular tourist attractions, the Music Hall has been attended by more than 300 million people. '"I believe in the supreme worth of the individual and in his right to life, liberty, and the pursuit of happiness. I believe in the sacredness of a promise, that a man's word should be as good as his bond; that character not wealth or power or position - is of supreme worth. I believe that love is the greatest thing in the world; that it alone can overcome hate; that right can and will triumph over might." A series of underground pedestrian passages stretches from 47th Street to 51st Street, and from Fifth Avenue to Seventh Avenue. Numerous businesses operate in the Concourse offering shoppers a range of products and services. There are also eating establishments and a post office. Access to the Concourse is available in several ways. There are stairways leading down from the lobbies in the cluster of six landmark buildings. Access can also be gained through the restaurants at the skating rink, via the elevators to the north and south of the rink. The Rockefeller Center rink itself is on the concourse level. Additionally, there is access to the western entrance of the Concourse through the 47–50th Streets subway station below Sixth Avenue (B D F M trains). The largest independent burger restaurant in the United States is set to open in the spring 2010. At Rockefeller Center street level, the plaza has about 200 flagpoles. At varying intervals, the flags of United Nations member countries, the flags of United States states and territories, or various decorative and seasonal flags are flown; during U.S. holidays, every flagpole carries the Flag of the United States. One Rockefeller Plaza (608,000 sq ft)—originally the Time–Life Building; an original tenant was General Dynamics, for whom the building was briefly named. 10 Rockefeller Plaza (288,000 sq ft)—Formerly the Eastern Air Lines Building. Eastern was headquartered there in 1975. After Frank Borman became president of Eastern Airlines in 1975, he moved Eastern's headquarters from Rockefeller Center to Miami-Dade County, Florida. The Today Show studios and the New York City-area offices of Aeroflot (Suite 1015) are located there. 1240 Avenue of the Americas: One of the original buildings on the site not torn down. It has been adapted as an annex building to 30 Rock. Originally built for the Associated Press, 50 Rock was the home to many news agencies. Isamu Noguchi's large, nine-ton stainless steel panel, News, holds the place of honor above the building's entrance. Noguchi's design depicts the various forms of communications used by journalists in the 1930s. The only building in the Center built out to the limits of its lot line, 50 Rock took its shape from main tenant's need for a single, undivided, loft-like newsroom as large as the lot could accommodate. At one point, four million feet of transmission wire were embedded in conduits on the building's fourth floor. 1230 Avenue of the Americas: Simon & Schuster Building (706,000 sq ft) —Formerly U.S. Rubber/Uniroyal. Center Theatre prior to 1954. 745 Seventh Avenue (Barclays Capital, formerly Lehman Brothers Building): Building now owned by Barclays Capital, the land by the Rockefeller Group. 1251 & 1211 are independently owned and are only managed by the Rockefeller Group. For a short time in the late 1950s, the Center also owned the original Roxy Theatre. The Roxy was purchased to obtain the air-rights to build the Time & Life Building. Once that building went up, the theater was sold and replaced by an office building. This building, while not part of the Center, is now connected to the Time & Life Building. Rockefeller Center (History) was named after John D. Rockefeller, Jr., who leased the space from Columbia University in 1928 and developed it from 1930. Rockefeller initially planned a syndicate to build an opera house for the Metropolitan Opera on the site, but changed his mind after the stock market crash of 1929 and the withdrawal of the Metropolitan from the project. Rockefeller stated "It was clear that there were only two courses open to me. One was to abandon the entire development. The other to go forward with it in the definite knowledge that I myself would have to build it and finance it alone." He took on the enormous project as the sole financier, on a 24-year lease (with the option for three 21-year renewals for a total of 87 years) for the site from Columbia; negotiating a line of credit with the Metropolitan Life Insurance Company and covering ongoing expenses through the sale of oil company stock. It was the largest private building project ever undertaken in modern times. Construction of the 14 buildings in the Art Deco style (without the original opera house proposal) began on May 17, 1930 and was completed on November 1, 1939 when he drove in the final (silver) rivet into 10 Rockefeller Plaza. Principal builder, and "managing agent", for the massive project was John R. Todd and principal architect was Raymond Hood, working with and leading three architectural firms, on a team that included a young Wallace Harrison, later to become the family's principal architect and adviser to Nelson Rockefeller.